“Adrift, as the title suggests will take you on a moving journey that does not follow a set course but navigates from the heart rather than from a compass or map.We are transported into a world where the author reveals the small pleasures in life in a playful, passionate, and intimate way. Adrift, we can wander like a nomad, float like a piece of driftwood, or take to the air on the wings of a butterfly. “Here is a war veteran whose ‘glistening medals and manhood ribbons’ vouch for his excellence in one field , and the heart- warming poemsin this debut collection vouch for his expertise in another. Highly evocative, stunning in their imagery, they echo the trills of birds; this poet is very fond of. Short and succinct, pithy and profound, wacky and witty, we have them in all hues in these pages. 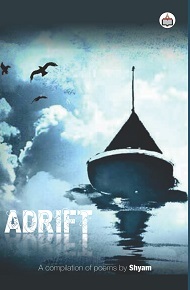 “Adrift is a treasure trove of gems penned by a selfless, sincere and very special poet. Author of Best Things in Life are Free. “This man can step into a mirror and drag his reflection out, demanding that it spills the beans on just who this Driftwood character is or call his shadow to heel and snip it off and have a talk with it in an attempt to discover once again who this Driftwood is. Mornings and moons come alive and argue with him about the “this of that” and the “that of this”. The North Star has its say and “a cat laps up the Milky Way”. He greets the world with such a gentle stoicism and a wry smile. He knows that the best of times and the worst of times come in the all at once. He treats both these upstarts as the same and like Yeats' horseman, passes by. He is not afraid of being afraid. He journeys within himself in order to reach this man called Shyam who is forever becoming a something else. But he knows that it is the journey that counts. He takes all that reality can throw at him and laughs in the face of adversity. He unties philosophical conundrums and if he encounters a Gordian knot, why he cuts through it with sheer good humour. He is fearless in his honesty and undaunted when confronting the “why” and “wherefores” of his “Not mad -nomad mind. He stands upon the threshold of sleep and consciousness gazing like a Cortez at the great ocean of self, his thoughts; the driftwood, one can only wonder at. One can only delight that a man such as he came to be. I met the words before I met the man and found that they are both hewn out of the same solid block of sincerity and truth. “I am Shyam!” the book proudly declares; behold the man in all his glory and imperfections. This is the real thing. Take this journey along with him and dive into the poems. And as you find out who he is; you find out that you are also discovering who you are.